2 Piece Adorable Alice Costume features lace trimmed apron dress with tulle and organza petticoat skirt. Includes matching headband. 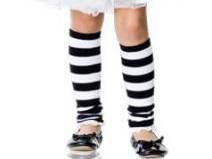 LITTLE GIRL STOCKINGS FOR POPULAR STORYBOOK COSTUMES.